Very sad to hear that Tony has passed away.He travelled the world doing what he enjoyed most and was highly respected everywhere his duties took him. I will never forget the great nights we had at Queens Halifax in Super League.Condolences to Jill and family. Very sad news about Tony, I first met him when he used to look after the ICI Hyde team in the NWCL league 30+ years ago. A really lovely man, lived for squash and I can't believe I was talking to him when we left the Nationals on Sunday evening. 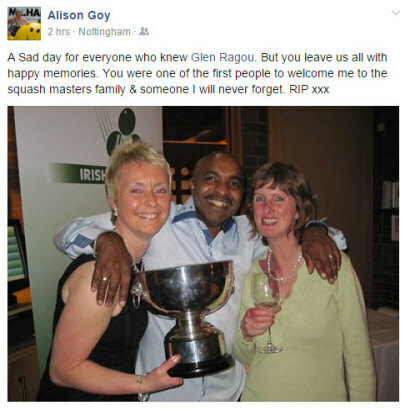 One of the most popular member of the Lancashire and North West squash community, after a long battle with cancer Glen Ragou sadly passed away today. Squash has lost a true soldier today. A legend, a hero, a gentleman. It's with a heavy heart that i say goodbye to you. The many years we shared training, competing and chatting court side, will be cherished, never forgotten. Your light will live on in your family and friends. So sad to hear the news of Glen passing away. I have so many happy memories of him and his infectious enthusiasm - he was always such great company. We played a lot and always slipped into our natural 'straight man v joker' roles (I think everyone knows who was who) - I think he often took more pleasure in managing to make me laugh rather than actually winning rallies! I have so many happy memories of Glen. A team mate and a friend. Someone who smiled in every circumstance and had a way of making me smile too. He was a selfless and kind man making life easier for everyone else. We spent many years training together, him always willing to play me at any time and at any venue. That was the kind of bloke he was. Sending me the wrong way countless times with his trickle boast and then laughing at me and with me at how frustrated I became. Glen.... You will be greatly missed but will be remembered with fondness by so many because of the happiness you gave to others. Rest in peace. 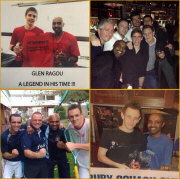 Glen played Squash the way we should all play life, that's why we all loved being with him. He mastered how to be, I wish I could be just like him. We had our last dance (tiger tiger Manchester, 2 am, July 15, Nigel's 50th, Faithless), you were not well but you were dancing your heart out! For me, it was the saddest of news, a sadness beyond words. 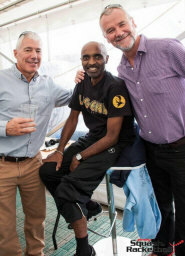 Glen was the very very best and was one of those people who always made you feel better for having been in his company, with a smile that could melt your heart. A fantastic squash player, tenacious, committed a role model to so many people. He recently received Coach of the Year at the Manchester Sports Awards which was richly deserved. I’ll miss all the banter and laughs we had whenever we met, rest easy my friend. A great character in the squash world will be missed. His determination was to be admired, still playing the game he loved until very recently! Will miss our battles. RIP Glen. 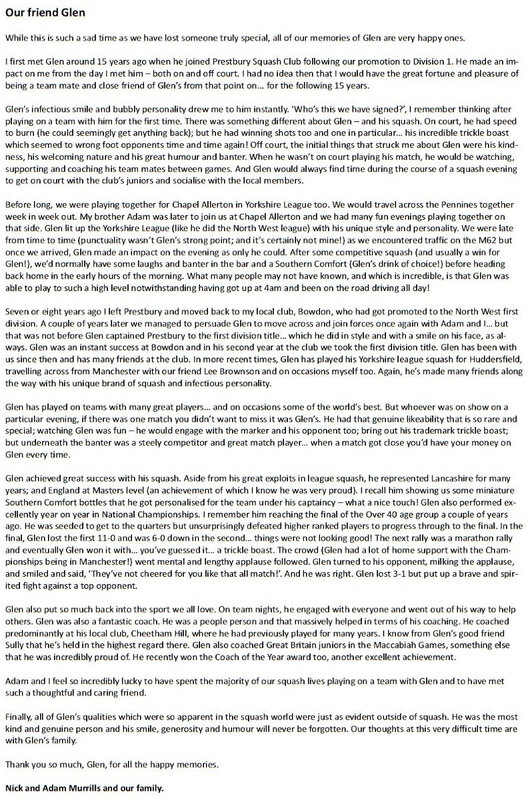 When people ask why do I referee I think of Glen. 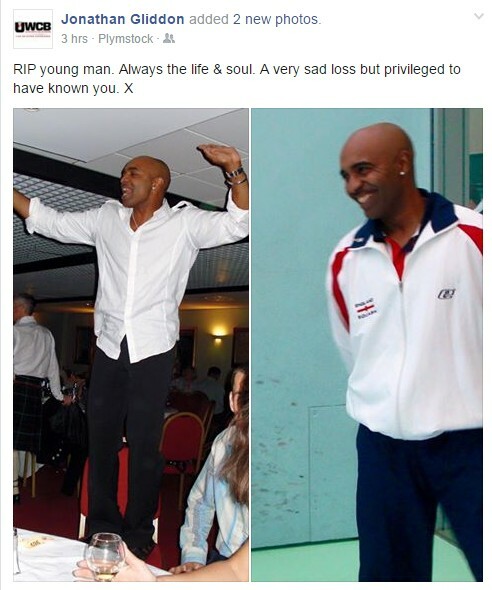 From the cheeky chappie who appeared years ago with Rasta beads hanging as a fringe (Yes he did have hair once) to the lovely cheerful man who was fighting cancer but still playing squash, he brightened up any balcony. Refereeing in the North West counties will never be such fun again. We will never forget you. Heaven can only be a happier place for his arrival. 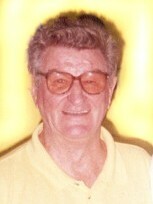 Kristen Callahan called me tonight and told me about Bob’s passing. I have been lucky to know Bob for a long time and shared many years of wonderful experiences and memories. I think the greatest things I loved most about Bob was how genuine he was and how quickly he made you feel special. I learned a lot from him and it was not just about coaching but about being the best you can be and passionate about what you do. It was an awesome journey for me…growing up with Bob, having the opportunity to work with him here at Princeton and especially being his friend. is the post I have been dreading to write for nearly three years. Dear Coach has moved on. Selfishly, I never wanted him to leave, but on the other hand, we all want the very best for him. All members of the family have been with him this week, for which we are grateful. As I reflect on the past years, I feel both thankful and privileged to have been by Coach’s side every step of the way. Some people battle cancer, but Coach lived despite his brain cancer. The diagnosis of a glioblastoma on 2/26/12 was shocking and upsetting, but together we chose to treat this finding as a bump in the road, still determined to live life to its fullest, enjoying our time together. Coach’s pre-mature retirement was not in the master plan but it afforded us the opportunity to spend every day together which was, in fact, a gift. Understandably, many cancer victims respond with anger, but not Coach. Over the last three years Bob navigated through the ups and downs associated with stage four cancer – never once cursing the world for his condition. His bright spirit and wit lit-up the halls and rooms at Sloan Kettering during each and every visit. It comes as no surprise that Coach did not “throw in the towel,” for as we all know, he is a true competitor. His perseverance and perpetual eloquence inspired us all. He accomplished so much despite his disease: coached a full season of PU squash, enjoyed his first two granddaughters, participated in Scott’s wedding, engaged in activities where he could, and encouraged us all. Amazingly, his innate ability to coach, teach, and inspire never subsided. Thank you for helping to give Coach such a spectacular send-off. When Bob was able to verbalize his thoughts, he told me he enjoyed a remarkable career with a fairy tale ending — Episcopal Academy and Collegiate Squash Hall of Fames, the Collegiate Squash Lifetime Achievement Award, Bedens Brook Tennis recognition, endowed PU Squash position, Princeton Junior Squash honors, PU Club of NY Squash recognition, Class of ’77 Honor, testimonial emails, calls,and visits. Bob never felt he deserved the recognition he received. Rather, he credits the wonderful, talented people with whom he worked that made those honors a reality. Thank you, thank you. The boys and I are grateful that he closed his eyes knowing the legacy he leaves behind. Needless to say, I am intimidated by the challenges that lie ahead; however, I know Coach would not want us to bemoan but carry-on and make him proud. Your support and prayers will be immeasurable as we transition to a new episode in our lives. Please help us keep Bob alive by remembering what he lived for and how he helped us all to be a better person. "We were devastated to hear the news about Bob and our thoughts and condolences are with his family and all his colleagues at US Squash and the collegiate game at this very tough time. "Bob was one of the most affable and likeable characters involved within the squash community but also a man who was held in the highest regard by all those who knew him and someone who inspired other. He will be sorely missed." 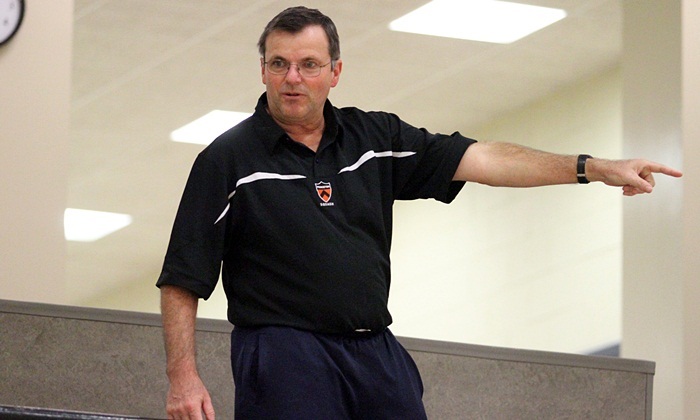 The Professional Squash Association (PSA) have today paid tribute to former Princeton Men's squash coach, and one of the most influential figures in American squash, Bob Callahan, who tragically passed away on January 27, 2015 aged 59. 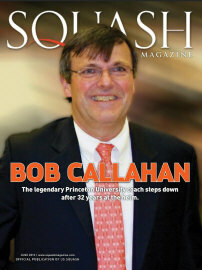 A respected squash coach, Callahan led the Princeton team for 32 years before his retirement in 2013 and led them to three national titles, ten Ivy League Championships and saw Princeton win more Skillman Awards for sportsmanship than any other college in the US. He also founded and ran the world’s oldest squash summer camp and in 1998 directed the World Junior Men’s Championship - the first time a world championship had been played in the US. He leaves his wife, Kristen and five sons, all of whom played squash under him at Princeton. Peter Byrne has passed away after a short battle with illness. 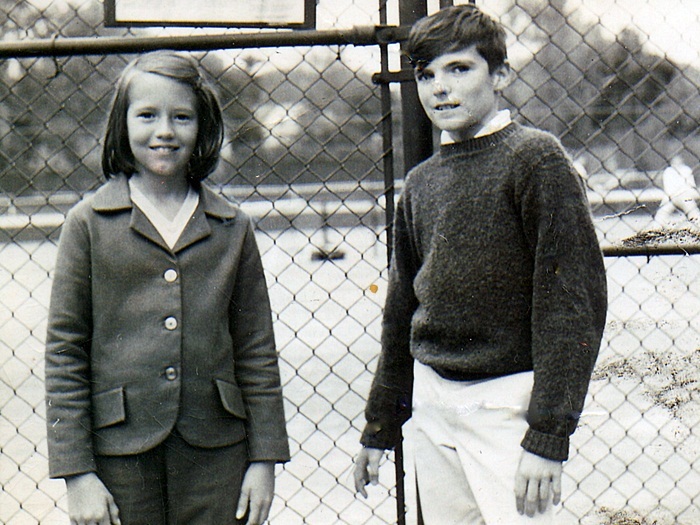 Peter was a former junior island champion and represented Jersey on many occasions. 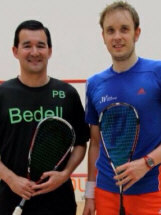 Peter was instrumental in helping sponsor a squash development officer through Bedell Group law company, of which he was a partner. 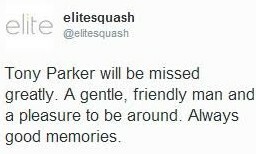 He will be sadly missed by all the squash community. Our thoughts are with all his many friends and family. May Peter rest in peace and we will continue developing the sport of squash with him always in our thoughts. Sad news, Joe Shaw passed away today in hospital in Brisbane. He found out about 5 weeks ago that he had lung cancer. After meeting Joe for the first time when I was 15 years old, he did everything possible to help me achieve in my life. I spoke with him about two weeks ago just before he went into hospital to start his treatment, and even then all he wanted to talk about was how my players were going, asking about Steve, Miguel and he was happy to hear Max was top 20 now. 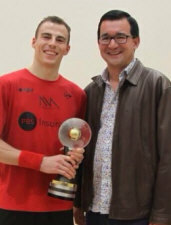 I have no doubt without his mental training program and his passion for squash I would have not achieved what I did. Even this year before I played the Commonwealth games he gave me advice on how to deal with coming back to play. I have so many good memories from travelling around the world on tour with Joe. My two favourite memories of Joe are when he was with me in Hong Kong when I won the HK open and became world no 1. Also at the world open in HK 2004, after I won my semi final we were on the ferry back with Shaun, Pat and other players and he was singing Waltzing Matilda out loud! 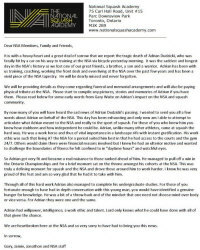 I want to continue his legacy that he had on the squash world and I intend to continue his techniques in my coaching career. I lack vocabulary in English to describe this emblematic figure that was Joe. I met him in Hong Kong a few years ago (2005 already), and we had a few laughs bless him. Charismatic, fast, funny, down to earth, pig headed…. Joe was never boring, that’s for sure. His devotion to his players, in particular to David Palmer, was legendary. He loved them, truly, and never ever forgot them. Stories, ohhhh, he had a few. Unfortunately, they were always “off the record, Fram”… Shaaaame I tell you! Always thinking ahead, always believing that he could change the World of Squash Coaching, always trying to pass on information, Joe was one of the most positive human beings I ever met. I just never realised he would die. And that’s why it’s such a shock to me. Larger than Life of Squash Joe was. In life you rarely come across a special person that truly changes the way life is for the better. Your ambitions matched with your ageless energy is something I have never seen and doubt will ever see again. Rest in peace our beautiful dear coach knowing that you made this squash world a better place. I have just heard of the passing of my great friend and mentor Joe Shaw. I am at a loss to write the words that befit his impact on my coaching let alone the friendship that we shared. His influence on the squash world and coaching community was as large as his personality. We first met via email when I was searching for information to benefit the kids I coached. He sent me 5 pages of thoughts and training .... and then promptly told me to go away leave him alone as I knew nothing about real coaching and he was retired. I found the information was truly enlightening and inspiring though being told to "piss off" a bit blunt. But this was Joe, tell it like it is. A week later another 5 pages appeared in my email with a request to call him if I wished to discuss. The discussion was very one-sided always Joe telling me how little i really knew. Heather McKay showing Joe how to grip a racquet....Geoff hunt showing Joe how to hold a racquet...Hashim Khan showing Joe how to hold a racquet...and the list went on. After introductions and looking at said photos, I smiled and laughed, Joe challenged, what was so funny ...you don't know how to hold a racquet do you? To which Joe burst into loud laughter and congratulated me on getting the joke. Joe's legacy will continue from players and teams he coached; to coaches he mentored and great future coaches David Palmer, John White and Brad Hindle. I first met Joe when he brought David Palmer and John White to Pontefract. He was the most engaging of men, original, passionate, strong in his beliefs. David and John were both ranked in the 40's at that time and, shrewd judge that I am, I told them both to find another sport! Joe's faith in David in particular, with whom he was very close, was total and how right he was proved to be. He was the sort of man, as David well knows, that once he was with you it was for life. He visited again and how thankful I am that our paths crossed. Life is ordinary all too often; Joe was extraordinary. My mum, Camilla Quarterman passed away on Saturday. 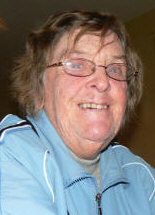 She was such a presence whilst I was playing on the Junior Circuit and she also coached many children from Oxfordshire. Three years ago my parents moved to Abu Dhabi, mum really developed the squash over there and promoted the sport at any possible moment-she coached lots of kids over there and ran their first ever tournaments etc. the service will start at midday and anyone is welcome to come and pay their respects and honour my mum's life. Jonathan was a top 20 in England player in the eighties, he played National League for Redwood Lodge and Weston Super Mare, and was also an England junior. 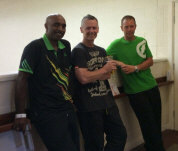 He may have won but if not certainly did well with Darran Mabbs in national Doubles. Jonathan retired prematurely and took up rugby and played first team for Weston. He died of a suspected heart attack aged about 51. My facebook page has many tributes already many from squash players. It is with a heavy heart that we inform the Squash Community that we have lost one of the great ones this week. After an eighteen month battle with cancer, Paul Marley passed away peacefully on Thursday afternoon. OTTAWA (ON) - It is with profound sadness we announce the passing of another Canadian Squash icon; PAUL FROST at the age of 67 years as a result of a tragic car accident on Friday, January 17th. Paul leaves behind his beloved wife Jane Mitchell, children Andrew, Emily and James, brother Peter and sister Patrica. Paul started his career as the squash and tennis coach at York University in the late 1970s, then moved on as a keen and inspiring squash pro to Mayfair West and Mayfair Parkway. Quickly with his extensive understanding of racquet sports and exceptional business moxy he became their general manager, spearheading the building of Mayfair Lakeshore. 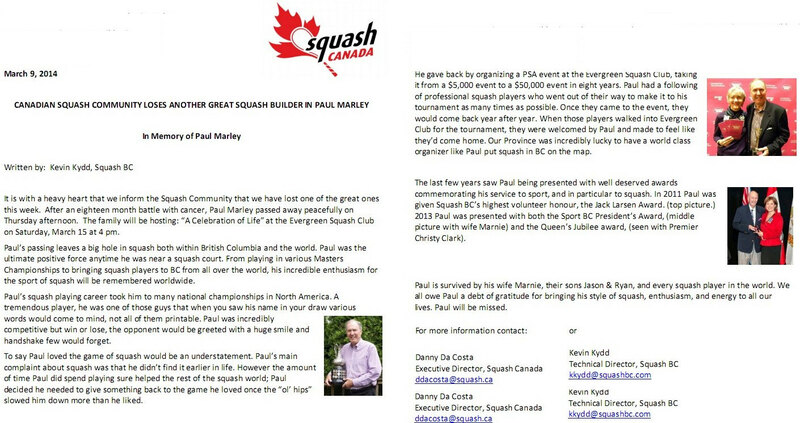 Paul was instrumental in transforming the Canadian commercial squash industry with the hiring of world ranked professionals Barbara Cooper and Willie Hosey as Mayfair's head pros. Paul will always be remembered as a very gifted player; winner of numerous National and Provincial mixed doubles titles, but more importantly as a soft spoken gentleman with incredibly soft racquet hands and an amazingly soft heart which he opened up to everyone in the game. Church, 230 St. Clair Ave. West (west of Avenue Rd. ), on Thursday, January 23rd at 11 a.m. Donations in Paul's memory may be made to the Canadian Diabetes Association (www.diabetes.ca) or to a charity of your choice. Squash Canada is saddened to learn that 15 year old Riley Mercer of Conception Bay South, Newfoundland has died of a rare form of Brain Cancer. Riley was a member of the C.B.S. Junior Squash Program. 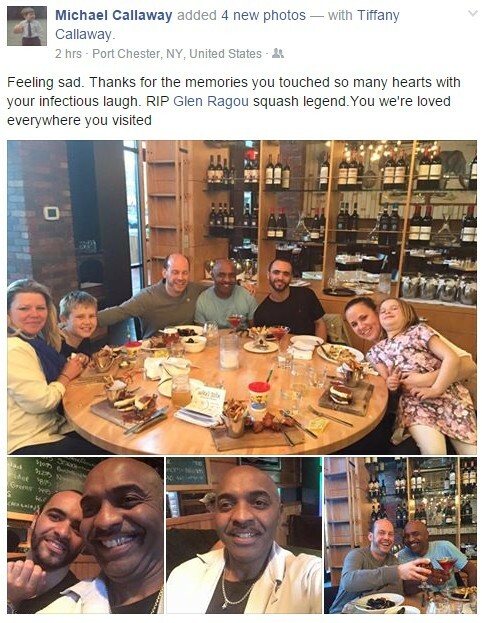 Squash Canada Executive Director, Danny Da Costa said, “Riley loved playing squash and he was a valued member of the C.B.S junior squash program, we are sad to hear that he lost his life due to Brain Cancer and we would like to extend our condolences to his family, Squash NL and his coach Eric Hart”. Mercer is the third squash player to die in the past month. 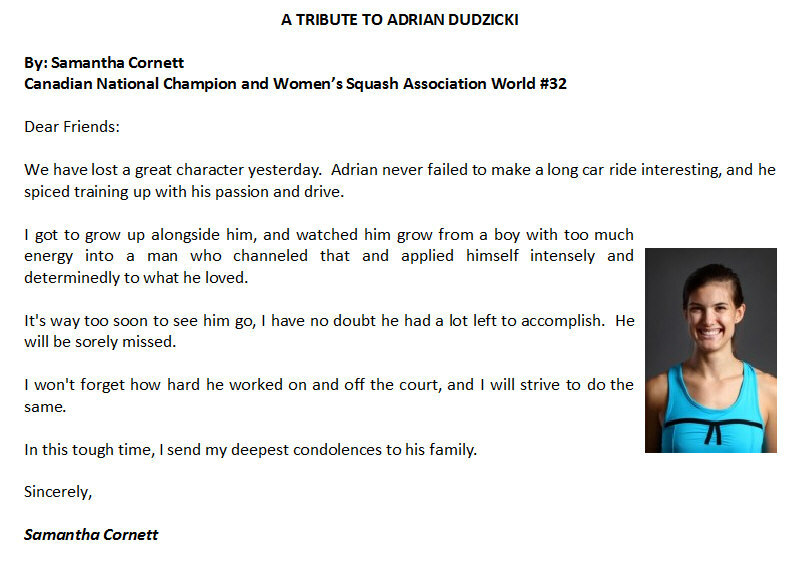 Canadian squash player Adrian Dudzicki died when he was hit by a vehicle while riding his bike to the National Squash Academy, while Mark Sachvie died from a heart attack while Attending Adrian Dudzicki’s memorial. 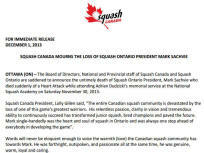 Mark Sachvie was Squash Ontario’s President and one of the most influential builders of squash in Canada, 1,500 people at White Oaks Conference Resort & Spa attended his celebration of life on Thursday December 5, 2013. 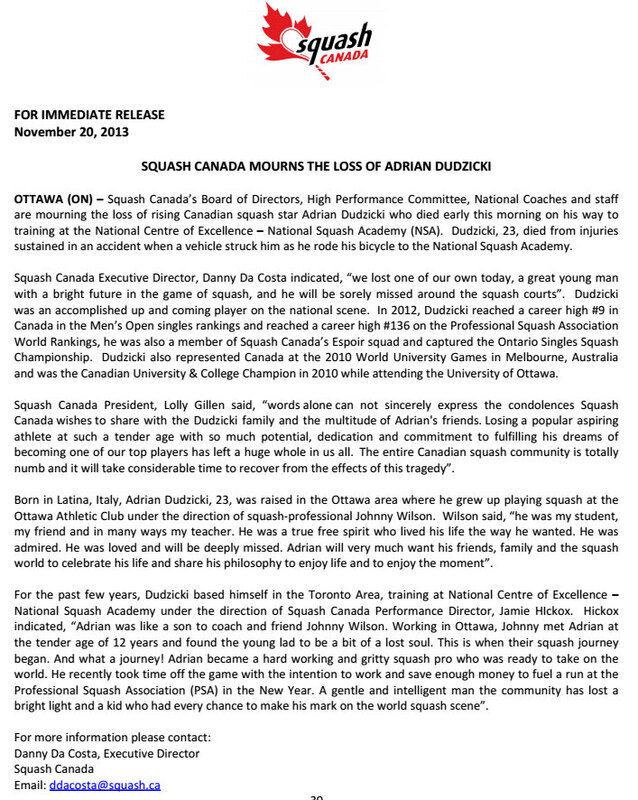 It is with profound sadness that I report for the second time in 2 weeks that a member of the Canadian Squash Family has died. 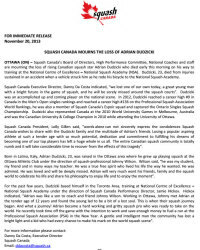 Mark Sachvie the 2014 Women's World Team Squash Championship Director, the Racquets Director of White Oaks and one of the most iconic names in Canadian squash has died of a massive heart attack while attending Adrian Dudzicki's memorial. 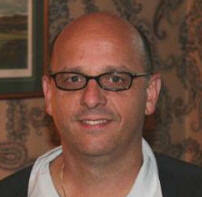 He is survived by his wife Cindy Sachvie, daughter Lauren and sons Nicholas and Chris. This is a a huge loss. Mark was my mentor, he was one of my best friends. I have known him for 7 years and we work everyday together to build squash and tennis at White Oaks and then at Squash Ontario. 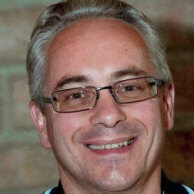 Mark was also the President of Squash Ontario and one of Canada's leading squash coaches. On Thursday, 14th of November we lost a young talented player Gaëtane Hitchins at the age of 22. Gaëtane was on her way to work by bike that morning when she was hit and killed by a car. Not only was she a great squash player, she was also a great and lovable person. She will be deeply missed. She was part of the national U19 selection several times and was top 10 on the women’s rankings. Our thoughts go out the her parents David and Lieve, her brother Vincent, sister Tess and her family and friends. Some sad news to report from Toronto today. Adrian Dudzicki (age 23) was struck and killed by a car this morning. He was on his bike heading to training at the NSA. 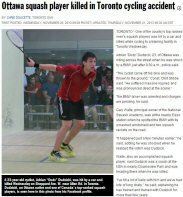 He was originally from Ottawa and currently playing full-time squash. This is very tragic news. Adrian was a fine young man. Tough loss he was on his way to train with some of our national team athletes and Jamie Hickox. I am very sad to hear of Dicky's passing. 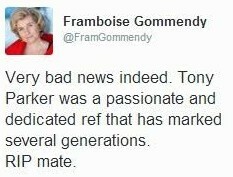 From the old school of sports journalism , he was a fine descriptive writer who had the respect of the sportspeople he wrote about. He was knowledgeable about squash and an interesting, friendly man with whom it was always a pleasure to spend time ..
Was truly inspiring. Farewell dear Man. So sad to hear of Dicky's passing. 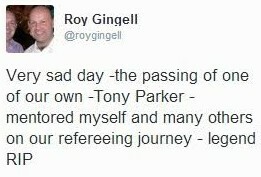 He was a fantastic journalist, have many great memories of our chats court side and in the bar. He will be sadly missed and my thoughts are with his family. Dicky was an Indian sports journalist who was cricket correspondent for the Hindustan Times from 1958 to 1966, when he became a freelance based in the UK. 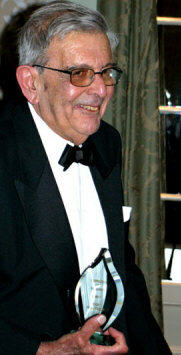 He covered cricket, squash and badminton for The Daily Telegraph from 1966 to 2005. With Anandji Dossa, he co-edited The Indian Cricket-Field Annual throughout its life from 1957-8 to 1965-6. He first wrote for Wisden Cricketer's Almanack in 1963, and his most recent piece appeared in the 2007 edition. He died on June 21, 2013 in London. Very sad news, Taught me about the greats of the game. Always a practical joker, Dicky once sent a Christmas card to subs after copy was changed. He wrote "and don't cut out the HAPPY' to them. It was with great sadness that I learnt of Dicky’s passing today. 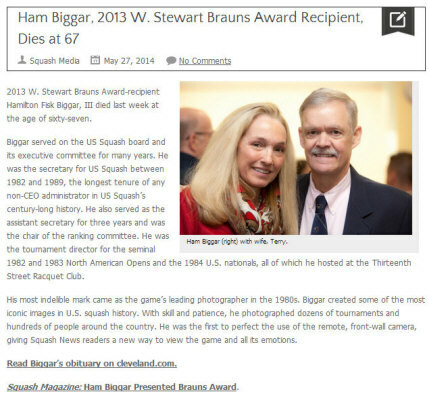 He was a great friend to all squash players, great company and a fine writer about our beloved sport. Many of us would buy the Daily Telegraph for his squash reports alone, especially in the days way back when few newspapers gave coverage to squash. He had a considerable knowledge about the sport and its players and was frequently to be seen in the tournament hotel with many of the games greats enjoying a post match dinner and a long chat, although often punctuated by having to rush off to file his copy. He had a wonderful sense of humour with a great sense of fun and there was very often a twinkle in his eye. It was therefore always a pleasure to know that he would be in attendance and covering an event. RIP Dicky, it has been an absolute pleasure knowing you. Dicky Rutnagur belonged to a journalistic age when quality writers wrote about the sports they loved; in Dicky's case cricket and squash. I well remember him bemoaning the fact that surrounding him on a cricket tour were a bunch of so-called journalists who were there solely to conjure up stories, such as the infamous Mike Gatting affair. Dicky was not only a fine journalist.he was a lovely, gentle, humourous man. He will be happy that he was true to the sports he ;loved. I remember him with fondness. It is with great sadness that I read about Dicky's passing. Along with Colin McQuillan, Martin Bronstein and Richard Eaton, Dicky was one of the first journalists I spoke to upon my breakthrough in the game. I was always astounded by Dicky's knowledge, passion and enthusiasm for the game. He had a unique insight and loved the history of the game yet embraced the future. Squash players and supporters worldwide will be saddened to learn of the passing of John Timperley who for many years was a prominent and influential figure in the game as it modernised in the 1970s and 1980s. John played badminton for England and was ranked number 1 in the country before switching to squash at 28 after a back injury ended his time at the top. He was naturally gifted and reached county standard playing for the Surrey first team. He was captain of the Surrey team that won the Over 45 inter- county championships. John reached the quarter finals of The British Open Over 45 in 1979 losing to the eventual winner Australian Kevin Parker. He was also an advanced coach. John was very much involved in the administration and refereeing of our sport. 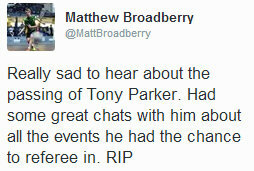 He refereed the British Open Final (maybe more than once) when it was played at Wembley. As an international referee he served on the referees' and markers' committee of the Squash Rackets Association and he was a widely travelled tournament organiser promoting the game throughout the world helping organise The Hashim Khan Trophy in Pakistan which was attended by the Prime Minister and former President Ali Bhutto and his daughter Benazir. He also ran the Caribbean Area Championships and the Spanish Open. He was involved in the early days of TV commentary and realised the power of the media in promoting squash. He was well ahead of his time on this. John wrote or co authored several squash books including 'Squash Rules OK' with a foreward written by Geoff Hunt ,which was published in 1983. He also produced a video of the 1978 British Open Championships with the athletics commentator Ron Pickering. In the early days of the pro tour John was a friend of many of the top players He even travelled to Pakistan to try and find out more about the Mohibullah Khan heroin incident, hoping in vain to help. In Peshwar John was strongly advised to drop his investigation because of fears for his safety. Mohibullah always pleaded his innocence and John organised his defence. Jonah Barrington spoke on Mohibullah’s behalf believing that the drugs had been planted on him. Mohibullah served seven years for a crime that many squash players thought he did not commit as he was number two in the world and a rich man in his country. John regulary visited him in Reading jail. He was married to one of England's most successful badminton players June White, although they later divorced, and he was the father of three children, David, Nicky and Karen. In his later years John became a lyricist, and writer of plays and musicals including one about JFK which was well received. 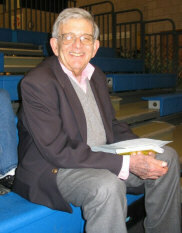 It is with great sadness that I heard of the passing of John Timperley ('Timps') last week. He became a good friend for many years beyond my short squash career at the beginning of the 80's. Always encouraging, always helpful, and with a wonderful sense of humour, he was at times a great influence in my life. John enjoyed an extensive circle of friends, and was always mindful of keeping in touch - one of my very first memories of him was during a 1984 squash trip to Barbados, where I watched with amazement as he sat down to write probably about 100 postcards in one sitting, the same apt and humorous one-liner on each! A good friend, mentor and a gentleman, like many others I shall remember Timps fondly. Our condolences to his family. German WSF Referee Peter Zöbelein tragically collapsed and died on 3rd May at the European Team Championships in Amsterdam. 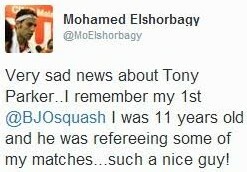 Not only one of the world’s top referees, Peter was a genuinely nice guy, liked and respected by everybody in squash. His passing at the impossibly early age of fifty is difficult to come to terms with. 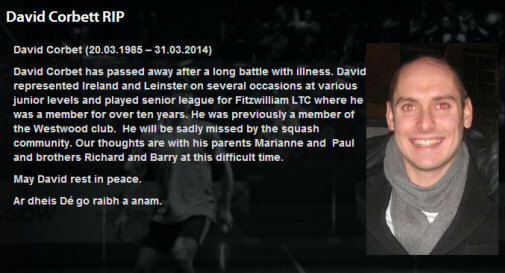 His families, his own and also his squash family will miss him hugely. We are all still in shock and very saddened about the sudden, shocking passing of Peter. 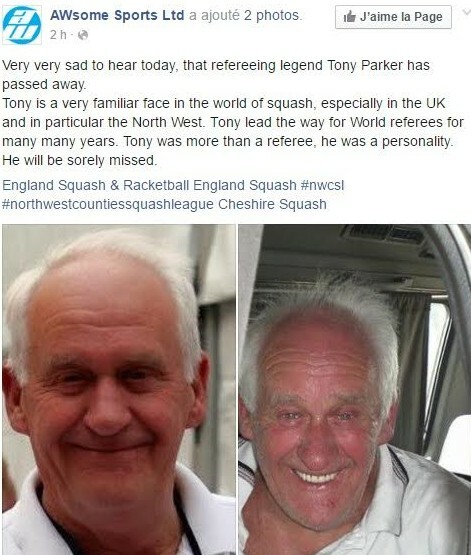 Peter was a well respected referee and will be sadly missed by his many squash colleagues and friends. My sincere condolences go to his family, friends and colleagues around the world. May you rest in peace Peter. I still try to find my mind after this, I can’t believe. 2 days before we are seating at the bar, drink beers and speak about some stuff… Great condolence to family and close friend. I knew Peter for 3 years He was a nice, heart guy, great referee. So shame…. It is a very sad day here in Amsterdam, since this morning. Peter Zöbelein was taken to hospital early this morning as most of the players were having their breakfast. He was taking by helicopter to the closest hospital, and received all the care possible. We unfortunately heard a bit later that he had passed away. The emotions are running high in the German Camp. Officials, Players, Referees, all are showing how deeply hurt and stunned they all are. Peter had become a familiar face on the tour, he was one of the "coming up" refs. He will be truly truly missed. A sad time in Amsterdam for all Peter's friends. He was a good companion, and a valued colleague referee. My sincere condolences to his family and all his good friends in Germany and beyond. My english is not perfect , but I want to say that I’m hearing very sad news. As I’m still just beginning to referee at high level, I met Peter last November in Nîmes. The first match I refereed was with him. Peter had a very pleasant behavior. He gave me plenty of good tips and he tried to put me in confidence. As we stayed in touch, I could see that Peter was very passionate about squash, and dreamed of finally seeing our sport become an Olympic Game. If it happens, make sure that I will have a big thought for him. 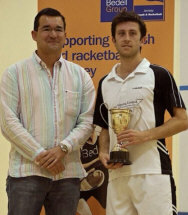 Very sorry to hear the news, we lost one good WSF referee and one who had passion with squash. We all miss you, Peter. 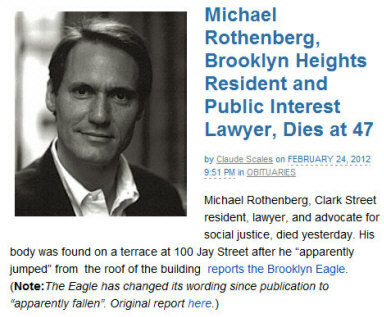 I still can't believe what happened on the 3rd of May where Peter Zöbelein collapsed at the breakfast room and died later in the hospital. It is hard to believe that someone you have known for arround 15 years is now no longer among us. My condolence goes out to the family and friends. We were all shocked and deeply saddened by Peter's ill health and subsequent passing in Amsterdam. His commitment, enthusiasm, and expertise will always be remembered by us. Sincere condolences to his family and friends in Germany. 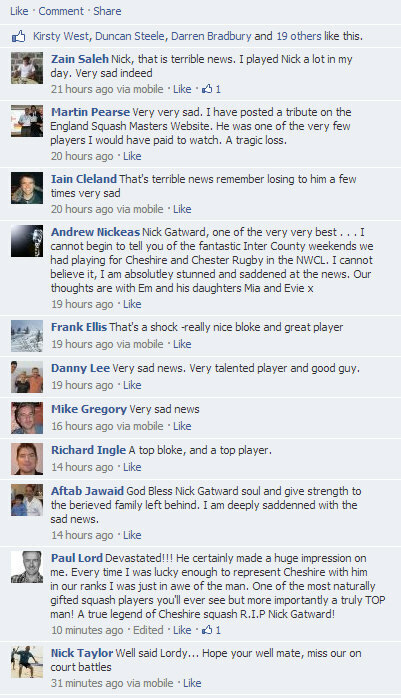 Sad news that Nick Gatward has passed away very suddenly in hospital. 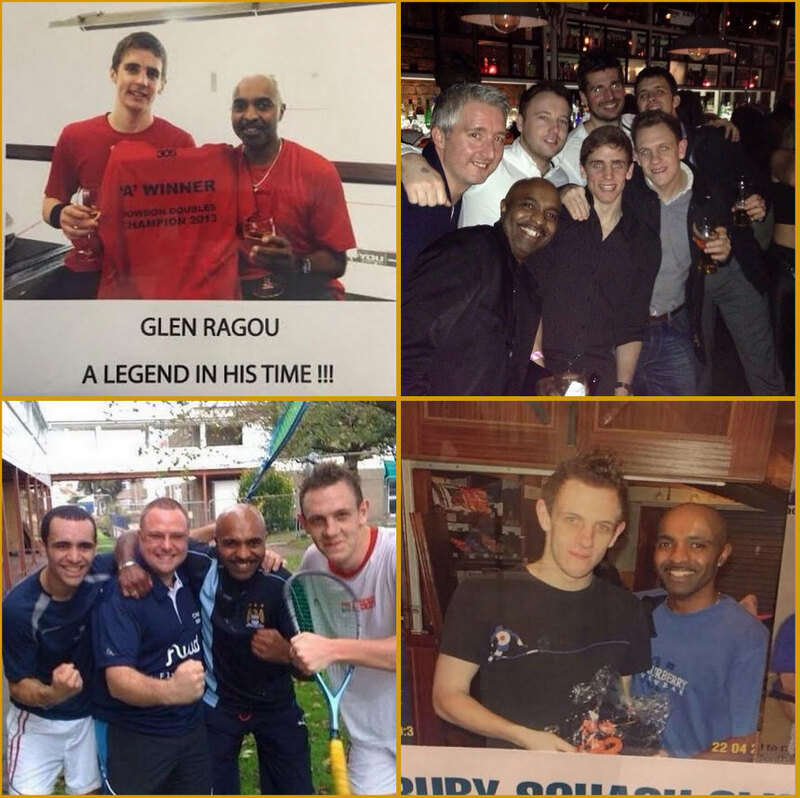 He was not only a very close personal friend, but has been a stalwart for Cheshire Squash, and England International and Masters National Champion. We had some fantastic times all over the UK playing inter-county, especially in the North East and Durham. Within my years involved Cheshire squash, and the North West Counties League, Gatward was a star. When we played for Chester Rugby Club in the NWCL, with John Clark, our number one was a very young and shy Peter Nicol ! He was the very, very best of people a great friend to all with fantastic sense of humour, a brilliant player with fantastic racket skills. 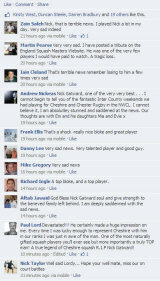 His passing has been posted on facebook and comments have been made from players from all over the UK. Gats will be remembered by everyone who met him, both on and off the squash court, and our thoughts are with his Em his wife and daughters, Mia and Eva at this very sad time. 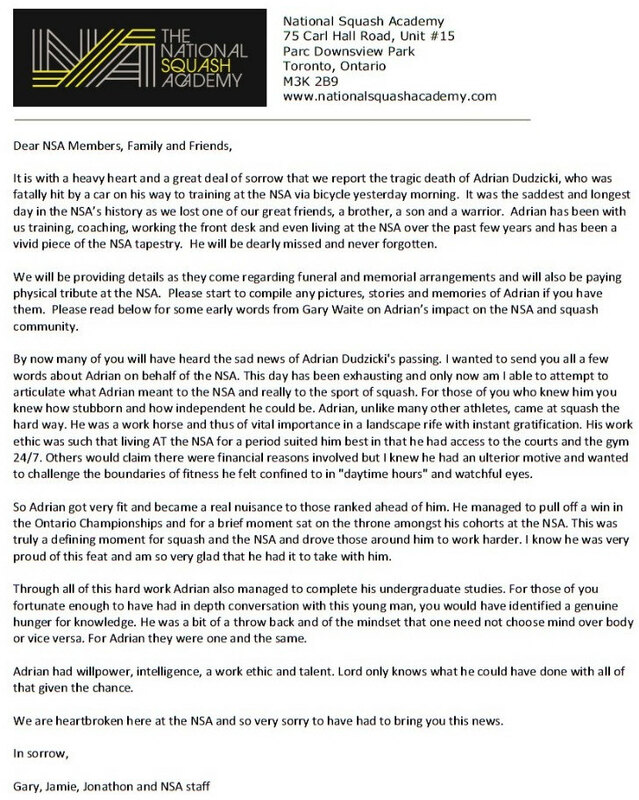 I am saddened to read about Nick. What on earth happened, he is far too young to have passed away. I am not on Facebook and therefore all I know is the brief bit on SS. I knew Nick from my Cheshire days. He always had a friendly face and a great laugh to be around. He was a joy to watch on court and all that needs to be said is ‘what a loss’. My thoughts are with his family. I am deeply saddened by the news of Nick's passing. 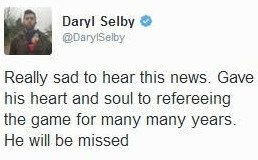 He was a fantastic player and great bloke. It is very sad to hear of Nick passing away,he was a fantastic squash player and in my opinion one of the most talented players that graced the sport. I can go back to 1977 when he was one of the best juniors in England and he gave me such a thrashing at Warrington Sports Club, and I thought that is how I want to play squash and it shaped my game and coaching career. We would always meet up over the years and reminisce about that match. I remember playing him in the Wrexham Open when I was in the top few in England and felt nervous as he was so gifted that he took the first game and it always reminded me of the thrashing I got as a junior all those years before. My prayers are with his wife and family at this time as he was truly an unique person. Devastated to hear the news of Nick’s passing, as a junior I learned a lot from watching Gats…a very talented and skilful player! We played Yorkshire league together for Ilkley for a season and enjoyed the conversations we had. Such sad news about Nick. I didn't know him well but I have a very strong memory of him in my career. We played on court 4 at Harrogate Squash Club and to this day I reckon it was one of my hardest, most challenging matches ever. Talk about tough! Not just fitness wise but ideas. I managed to scrape through in 4 but I felt like I had reached a milestone and just beaten Jahangir Khan! Considering that match was probably around 1986 I remember it like it was yesterday. My thoughts go out to his family and friends. We played in the same team together many years ago in NW counties and those were some of my favourite seasons as I enjoyed his company so much. A great player, great person and a tragic loss. 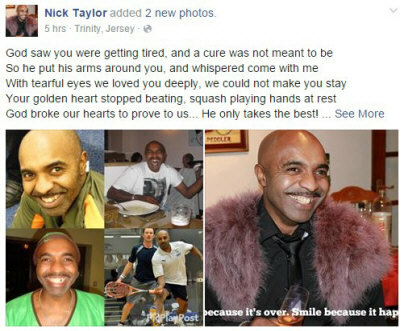 I am deeply saddened of Nick's passing. Such a talented player and such a great guy. Being raised in the Chester area and played in north west counties I remember how much of a great reputation he had and a great personality. My thoughts are with his wife and family. 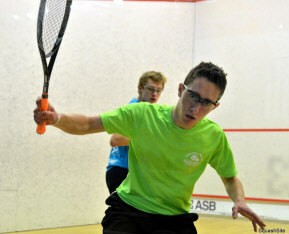 Nick Gatward was a wizard with the racket. I can remember playing him on the glass back at Chester Rugby Club…. The court always seemed so much bigger when you played Gats. I’d hit a lob above his head and I kid you not, Nick facing the wrong way, ie the glass, hit a winning volley boast with his eyes closed as the ball was over head. It was outrageous. “Didn’t tell you I’ve got a special eye in the back of my head,” he said with a smile. Ace fella. So sad to hear the news of Nick's passing. Like many in the North West, I have great memories of Nick both on and off court. He was a true gent to play and I'll keep fond memories of our battles! A sad loss. So shocked and saddened by the news of Nicky Gatward's passing. New him from my days playing Chester And District Badminton Leagues where Nick used his squash skills to bamboozle us. I woke up this morning to find out the passing of Nick Gatward. I'm really shocked and saddened. A true gentleman with a great sense of humour. 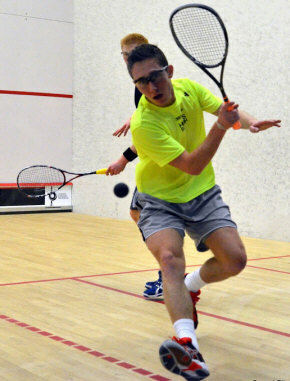 A hugely talented left handed squash player who could find shots from anywhere. I'm honored to have played in the North West counties league with him and against him. My thoughts and prayers are with Nicks family and everyone associated with this great man. RIP my friend. I recognise the SS picture from the Masters Home Internationals in Nottingham. He was without doubt a modest gentleman, a very gifted squash player a National Champion and an England Masters International. I am proud to say I played against him and it was a honour and a lesson I will not forget. What terribly sad news. Nick was a hugely respected figure on the national squash map and in Cheshire - as a big part of our close squash family - he was almost mystical. Everyone has a story about Nick and every one would emphasise his cheerfulness, sportsmanship and great character. Everyone loved him, though on court this love was often stretched by him yet again sending his opponent the wrong way, and perhaps with a cheeky little grin to rub it in. One of the few genuinely great talents and someone whose very name evoked warm affection. I am very sorry to hear of Nick's passing. I have very fond memories of playing alongside him for Chester rugnby club on a tuesday evening. He was a joy to watch on a squash court and had a real "squash brain". He saw the game in a different way and as a young professional at the time I felt I learned lots by being in the same team week in week out. Off he court he was equally as enjoyable to be around and he will be missed greatly. My thoughts go out to his family at this difficult time. R.I.P Nick. So very sad to hear of Nick’s passing. It was a great privilege to play in the same team as Nick when he played in the Shropshire League. As a left hander I loved watching him play, he was an immensely talented player, the times I watched him turn his opponents inside out with his ability and skill never ceased to make me smile. In the bar after he was always great company and ready to join in with the post match banter, a genuinely nice bloke and a true gent. I have had the pleasure of knowing Nick for many years. Playing against him in the early 1980's and getting resoundly beaten and, in more recent times, playing in the same team for Chester Rugby Club. 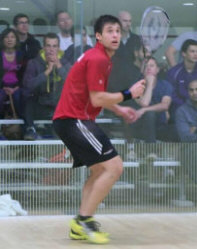 He was one of the most gifted squash players I have ever seen and always enjoyed watchin him play. On court and off court Nick was a true gent, always having time for everyone and always with a laugh and a joke. I will miss him. 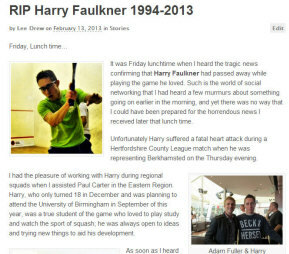 Several players here knew or had played Harry and Pontefract Squash Club would like Harry's family and friends to know that our thoughts are with you. My thoughts are with Harry's family at this difficult time. Harry was one of the nice guys, a pleasure to coach as well as being very respectful to all those around him. He will be sadly missed but never forgotten. Hundreds of people turned out to attend the funeral of Adri van Noort on Saturday October 13th. The 51-year old passed away unexpectedly last Tuesday due to a heart attack. During the 2-hour service in the Agatha church in Beverwijk, former Dutch champion Eric van der Pluijm addressed his good friend on behalf of the national squash community thanking him for all he did for the game. Van Noort, who worked as a policeman for almost 35 years, was well known to Dutch squash due to his involvement in the organisation of almost every major squash championship staged in the Netherlands for the past two decades. Just two days before his death, Van Noort had organised what was to be his last tournament in the Dutch city of Hoofddorp. 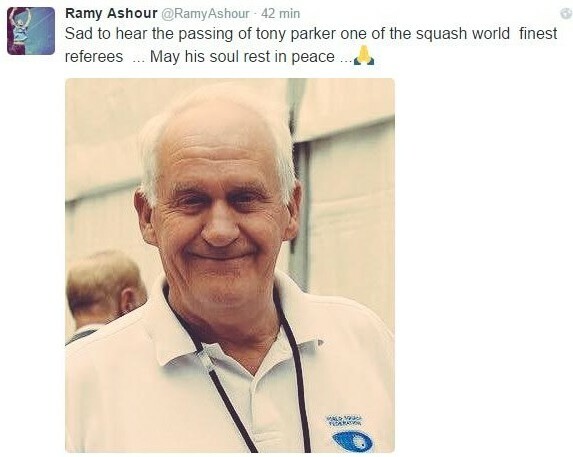 His death has come as a major shock to the Dutch squash community and he will be dearly missed. The SRFI Executive Committee and staff at the Indian Squash Academy are all extremely sorry to hear of the untimely death of one of our leading squash coaches Mr Sunil Verma of the Jindal Squash Academy, Maharashtra. 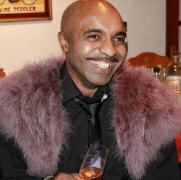 Sunil died of a sudden heart attack yesterday evening. Sunil had the distinction of producing international class players like the Sandeep & Vikas Jangra, Urwashi Joshi and Saumya Karki. Hundreds of other children also benefited from his coaching. Sunil has travelled on a number of occasions with the Indian team. The last trip was early last year with the Indian Juniors for the Asian Junior Individual Championship in Jordan. It is indeed a great loss to Indian Squash and his contributions to the field of coaching shall always be remembered said Mr N. Ramachandran, Patron of SRFI and World Squash President. Echoing his sentiments Mr Srivatsan Subramaniam, Secretary General of SRFI said the SRFI mourns the loss of a great coach. All the coaches at the ISA lead by Maj. (R). S. Maniam and Cyrus Poncha express sadness at the loss of a true friend. We cannot imagine the pain of losing a spouse. We extend our deepest sympathy to his wife Shanti and all his relatives. At the 2004 Tournament of Champions, the MSRA presented its Board of Governors Award to Michael Rothernberg for his outstanding contributions to the MSRA and to the game of squash in the New York Metropolitan area. 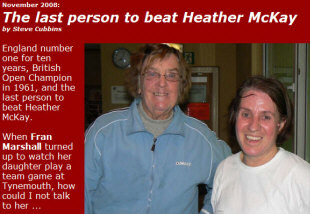 Fran Marshall, British Open champion in 1961 and England number one for a decade, renowned as "the last person to beat Heather McKay", passed away this week in Northumberland. It was with sadness that I heard that Fran had died last week. Fran was a great ambassador for squash in Yorkshire and I was lucky enough to be able to benefit from her expertise through coaching provided via Yorkshire squash. I played against her several times in her later years, finally stealing the Yorkshire title from her before she retired. She was a great character in squash and will be much missed. I would like to offer my condolences and best wishes to all her family. Nicolas was a great talent during juniors. He won 9 Belgian junior titles between 1990 and 1999 and was part of different national selections over the years. 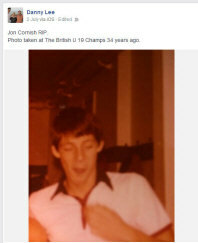 Not only was he a great squash player he was also a great person with a great sense of humour. Belgian squash are in shock! 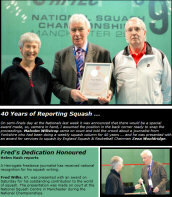 Fred was one of the greats of a breed which is sadly dying: the ‘regional press squash correspondent’. I knew him for more years than I care to remember – and all the time he successfully reworked local, national and international squash news to make sure that his YEP readers had the best Yorkshire version. Fred was a lovely man and looked after the BSPA’s press needs for over a decade. It was always a pleasure to deal with him, and just great to chat to him on the phone before each event when he would meticulously go through where each player was from having not been able to read my hand writing! Top man, rest well Fred. His contribution to squash over the years has been incredible. 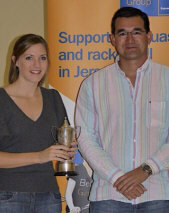 ESR awarding Fred an Outstanding Contribution to Squash award at the National Championships in 2009. Malcolm Willstrop presented Fred with his very well deserved award in recognition for his long serving support of squash in England. Fred will be greatly missed by all involved in squash especially in his native Yorkshire where many of us relied on Fred to accurately report on matches and events throughout the county and beyond. All in Yorkshire, players and county administrators alike, are extremely saddened to learn that Fred had passed away. 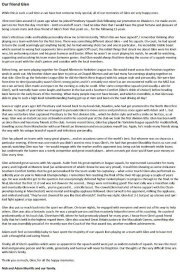 Fred had provided a unique service to Yorkshire squash for many years reporting the results of Yorkshire league matches and other activities in his column in the Evening Post. In particular, Fred was keen to encourage Yorkshire juniors and was constantly seeking out information on which players had performed well at the various events. Apart from his dedication what was most impressive about Fred was his attention to detail sometimes making numerous phone calls to ensure his facts were correct. 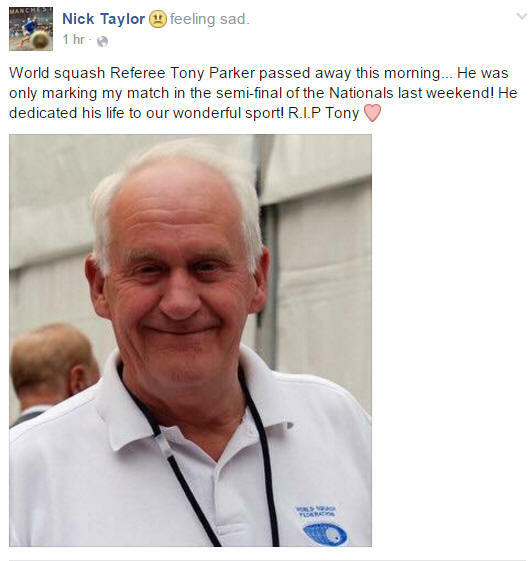 He will be greatly missed by those involved in Yorkshire squash and our deepest sympathy is extended to his family. On behalf of Yorkshire squash. It is with great sadness that I learn of Fred’s passing. Fred was a dedicated servant of the great sport of squash in Yorkshire as an ever present reporter of all things Yorkshire squash. He always ensured that any successes involving Yorkshire squash players was presented to the community through the medium of the Yorkshire Evening Post. He was an integral part of the boom in squash in Yorkshire on both a national and international scale. 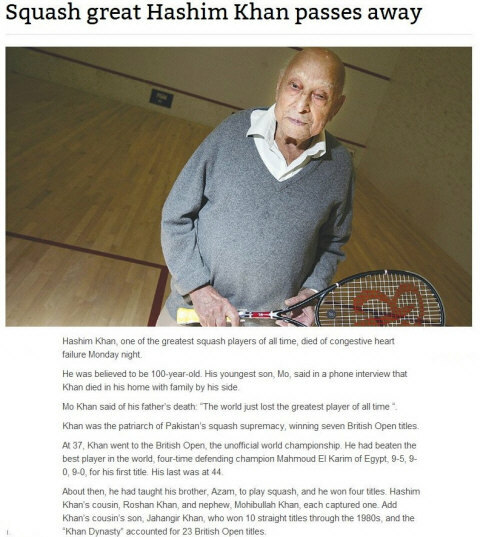 He was probably the reason why elite squash has become such a integral part of the county’s culture. Fred’s consistent and regular reports were to be relied upon. It was only fitting that England Squash should recognised his contribution to squash and make their special award to him for services to the sport he served so well. 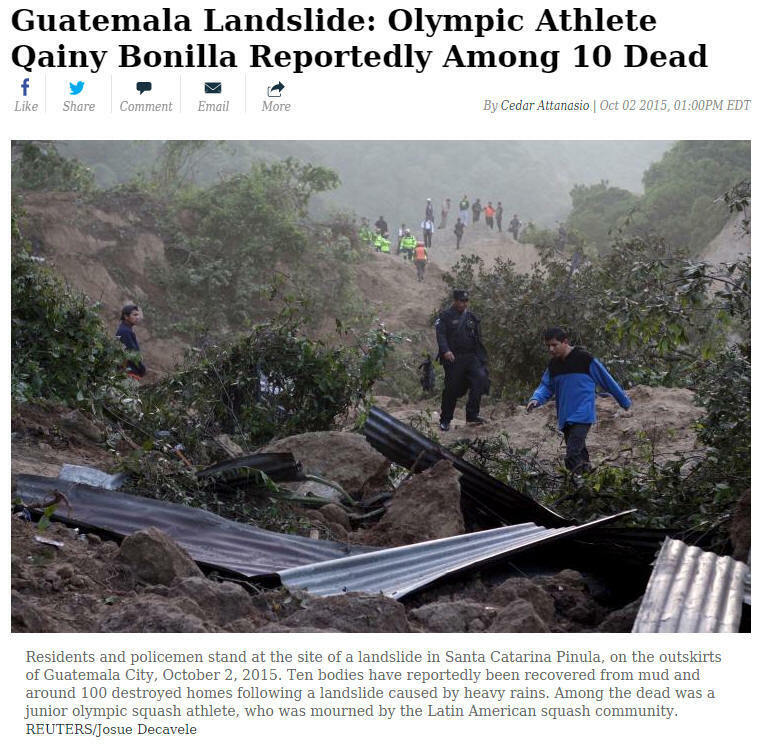 It is especially sad to consider that Fred may well be remembered as one of the last of a dying breed of squash writers able to contribute regular column inches in the printed medium when it is such a struggle against the background of priorities given to other sports and the lack of space to fill. I first met Fred as an up and coming junior in Yorkshire when he would always keep in touch with me, following my career on behalf of the newspaper through County Closed championships and beyond. He was always genial, supportive, a great enthusiast and regular attendee at events he could get to. His commitment was unquestioned and highly valued. Fred will be sorely missed and my deepest sympathies especially go to his family in their sadness, while at the same time mourning the loss of a truly devoted squash man. It was with great sadness that I heard that Fred had died. He was a mannered, civilised man, whose contribution to the game of squash, through his sustained and dedicated work for the Yorkshire Evening Post, cannot be underestimated. It helps to know that I was present when England Squash paid tribute to him for his work and his modest pride that day is something I will always remember. You will be much missed, Fred, and thanks for everything. The words unsung and understated would be appropriate for Fred. For so many years now squash has had representation in one of the prominent regional newspapers, the Yorkshire Evening Post, every Tuesday. Fred wrote this tennis and squash column and the amount of time and effort this demanded of him is immeasurable. 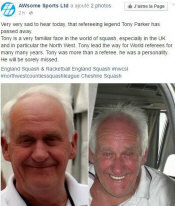 He did a great service to squash in the Yorkshire region, and few may know it. I remember clearly our regular telephone conversations after major tournaments. He was always genuinely interested and delighted in the success of the region's players. I appreciated his support and honest reports greatly. I remember Fred as a gentle, warm man. It's so sad to hear the news. He will be missed; my best wishes to his family.